To create a fully operational conveying installation, other complementary handling facilities are also manufactured such as centrifuges and crushing machines. Centrifuge drum resting on a generouslydimensioned system of bearings. Totally protected in order to prevent the dirt from entering the system. Pusher base with vertical movement within the drum. Soundproof centrifuge enclosure filled with a mass that absorbs vibrations. High level of oil elimination. Can work continuously for many years. High level of operating safety and silent functioning (under 75 dBs). 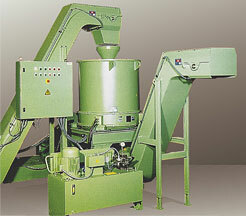 No need to clean the drum, even when working with grinding sludge. Easy maintenance and repair thanks to its highly wear-resistant coating. Totally automatic and continuous operation.